We started our stay off on a slightly bad note as I had spoken to the home owner about our arrangements to get to the house. My husband is from St. Vincent so I felt we didn’t need transport. It was agreed that we would just be escorted but a cab driver still turned up at the airport and insisted on charging us for the journey he had to make. The property manager had no idea about my discussions with the home owner and I had to go through my emails etc to prove what I was saying was true. Not great when you’ve been travelling for a day and just want to relax. He did provide some water, butter and bread for us though which was a nice thought. The house is spacious and very family friendly (4 kids and 3 adults) as it has a dining area and a table in the kitchen too which meant that we could have dinner together. The main living area is one big open space which the children could play in or watch TV but unfortunately unlike the bedrooms there wasn’t any air conditioning which meant that it got very warm in the sitting room/dining area and the fans didn’t work properly. The main living area was also a little dark compared to the rest of the house, as it’s quite a large space it was hard to get enough lighting, especially during the evenings. Lamps and the like were provided but some of the sockets were faulty so we left them alone. The outdoor space is very nice to relax in during the evenings, just take some mosquito coils or citronella sticks. There are a lot of locks/padlocks all around the house (which I understand) but we weren’t given the keys to certain doors which kind of ruined the point of having them. We had French doors in the master bedroom which led onto the back veranda but couldn’t use them as they were locked. We did manage to pick a few fruits and the children loved the outdoor space. Overall this is a nice property to stay in as there is more than enough space for everyone to have some quiet time alone but also family time together. The kitchen is big and well equipped and we enjoyed preparing meals together. The property just needs a little updating here and there (especially the light and power sockets). I would recommend hiring a car if you can as it was easier for us to get around and the property is in a good location. Not too far from Kingstown and there are two beaches within a 10 minute drive. We had a wonderful stay for 5 of us. 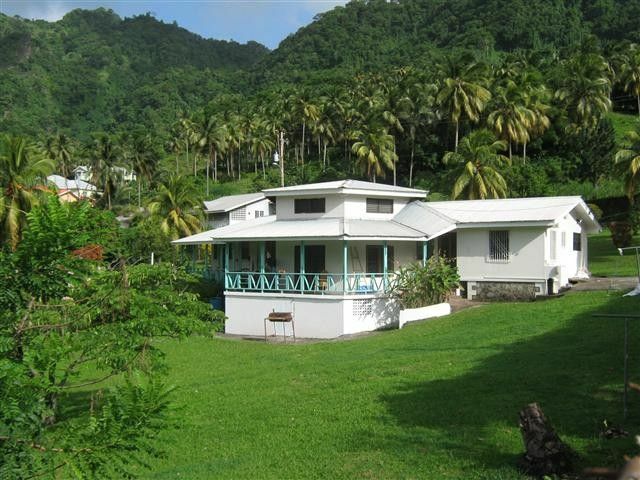 The Villa was clean and large with good kitchen accommodations and very nice bedrooms. We were checked in by a very pleasant and helpful property attendant. A car was helpful to get to the property. The view was beautiful from a large porch. We would definitely stay there again. Thank you so much. You will be welcome to stay again any time. spacious and pleasant. Nice view. Bedrooms and baths adequate. Overall, we got along fine. The property was interesting and the house was adequate for our needs. We were a party of three adults and three children. The children had plenty of space to play and run. The general condition of the house is beginning to show some need of upgrading and deep cleaning. The ceiling fans were filthy, crusted with dirt. The kitchen cupboards had black mold and were very old. The outside of the cupboards had not been cleaned and had food stains. The kitchen cooking utensils were a mess, unorganized and some questionably not clean. Master bath shower faucet did not work properly, needs replaced. The quest bath shower faucet was a bit tricky to get hot water. Floors had not been mopped properly, our feet were dirty after the first walk through. Correctly, one needs a car or must depend on taxi service. Refrigerator and stove old.We were nicely greeted and a welcome snack was provided, a very nice touch when arriving in the evening. We were a bit uncomfortable with all of the exits locked with padlocks. A concern if a fire. But we figured out a way to get around the problem that was a comfortable solution for us, but be aware that this property is locked with padlocks everywhere. Some of the padlocks there were no keys available. My stay was very lovely and the hous was very very comfortable and spaces for myself and family! I was in constant communication with the property owner prior to booking my trip and the property manager when I arrived. I had an unexpected one day layover and notified the owner. On arrival the house (inside and out) was covered in cobwebs, big dead roaches and clearly was not prepared for guests. We also had no notification before arrival that the house was only equipped with U.K. Outlets. Only one room had mosquito netting and most of the doors and windows did not have any screens to keep bugs out, which is more than necessary in a tropical climate. The gardener also was at the property 3 days for a full work day on each day. Surely the gardening could've been taken care of prior to our arrival or after? The overall property has a nice aesthetic and the fruit trees are great. However I would definitely look elsewhere next time. I am so sorry that we let this guest down on this occasion. The house is usually cleaned prior to our guest arrivals and gardening too. Please accept our sincere apologies. In December 2014 myself and my partner went to St Vincent to get married. My 2 sons, their partners and my sister and her family came too. The villa was amazing- home from home except for the weather which was stunning. The only thing I would suggest is a vehicle being so far out became expensive using a taxi every where we went. Every thing we wanted in the villa was there. A beautiful setting for a beautiful villa. Everything in the villa was just as described and more. Just saving up to go back! Thank you Vanda for making the time spent on such a beautiful island wonderful.